Sales Manager Arnie Glausiusz demonstrating TCB installation. TCB were pleased to exhibit at UK Steel Construction Day 2018. The event was organised extremely well by the SCI and took place at the Royal College of Physicans, Regents Park HQ. Chris Wise of Expedition delivered a very well-received talk on MAGIC : Marginal Gains in Construction – a UK industry strategy to deliver more value with less cost. Attendees were comprised of leading lights in the UK construction industry with engineering consultancies, fabricators and main contractors amongst the delegates present. 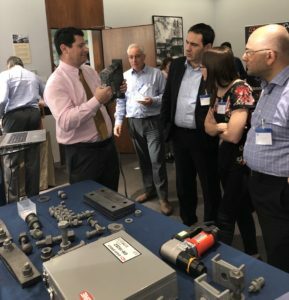 During this 1 day event recent projects taken from different sectors of the steel construction industry demonstrated innovation, cost, time and energy savings.